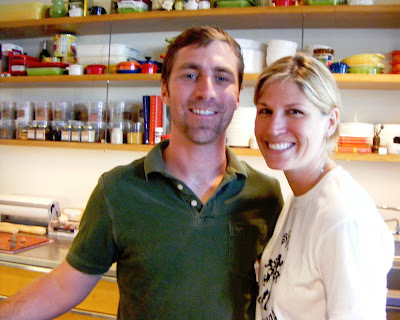 And now, from the better-late-than-never department, say hello to Anson and Jenny Klock — owners of Picnic on Phinney Ridge. That’s what I did late last week after a friend’s eyes widened in shocked surprise when I told her I’d never been to their year-old “food + wine boutique” nor tasted their housemade pork rillettes. Life’s a Picnic — literally — for Anson and Jenny. Since I was in the neighborhood and my reputation was at stake, I hightailed it over there. First thing to catch my eye when I walked into the place was the wine. Though the Klocks specialize in small wine producers (many of them local), they offer a broad range of fine labels and Thursday night tastings for a petite fee ($8, noshes included). I was thrilled to see splits of chilled Laurent Perrier in their deli case alongside their charcuterie. That Champagne-with-a-capitol-“C” is one of life’s little luxuries (one that Mac and I occasionally indulge in) and the perfect foil for another: those rich rillettes. I ordered a rillettes sandwich to-go since I’d just had lunch, and eyeballed the many splendors in the deli case, including Paul Bertolli’s famous salumi, Estrella cheeses and duck confit. “That’ll be a couple of minutes,” said Jenny after taking my order, leaving her husband to layer the fatty spread — garnished with his homemade brandied currants and pickled onion — on Le Fournil baguette ($10). In the meantime, I went back to perusing. I would have loved to have sat at one of Picnic’s tables and relaxed in the very contemporary little cafe (here’s the full menu). But instead I asked Anson to cut a slice from my sandwich before wrapping it so I could have a quick bite. And as I stood there at the check-out counter checking out my sandwich, the taste and texture (melting, crunchy) knocked me out. So much so, I also purchased a four-ounce jar of rillettes ($10) so I might re-create the sandwich at home. And guess what I had for breakfast the next morning? A few minutes in the toaster oven and — voila! 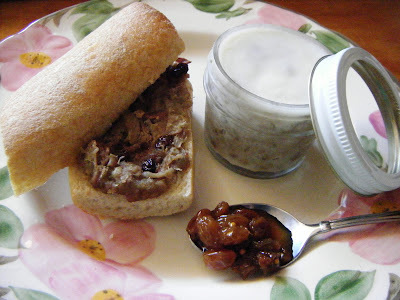 — one amazing breakfast, seen here with a side of rillettes and a spoonful of Boat Street pickled raisins.